Jerad Eickhoff went on the disabled list in spring training. 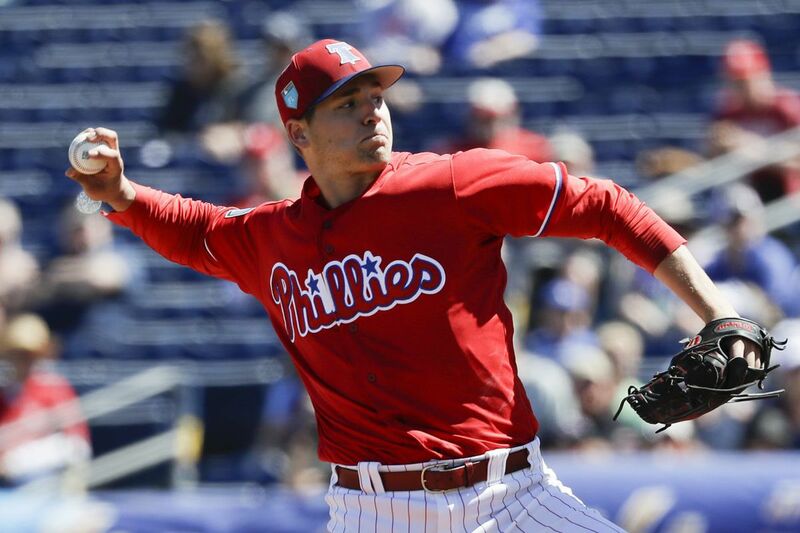 Jerad Eickhoff took another step Tuesday morning on his road back from the disabled list by pitching in a nondescript game on the backfields of the Phillies spring-training complex in Clearwater, Fla. The reports were good, manager Gabe Kapler said, and the team is happy with his progress. But it remains uncertain toward what, exactly, Eickhoff is progressing. Later on Tuesday, Kapler declined to commit to Eickhoff having a rotation spot when he returns from the disabled list. The righthander has been sidelined since spring training with a back-muscle injury. General manager Matt Klentak said two weeks ago that "when he comes back to this team, he's going to be back in the rotation." "We'll see how he looks when he's fully healthy and capable to contribute and see where our rotation is at that point," Kapler said. Eickhoff struggled through injuries last season before getting shut down in September with nerve irritation. His performance in 2016 — a 3.65 ERA and 197 1/3 innings over 33 starts — provided enough of a track record to secure Eickhoff a rotation spot when spring training opened in February. Should he be ready to return by the end of May, it might be challenging for the Phillies to find a spot for him in the rotation. Aaron Nola has been brilliant. Jake Arrieta is not going anywhere. Zach Eflin has a 0.71 ERA in two starts since being promoted from triple A and would be hard to push out if he continues to thrive. Nick Pivetta has struggled in his last two starts, but the Phillies seemed committed to him. Perhaps Eickhoff's return could lead to Vince Velasquez's power arm being moved to the bullpen. The Phillies have about a month to figure it out. "The cool thing about the way our rotation is going right now is that we don't have to make any decisions right now," Kapler said. "We have plenty of time before we have to get to that and at this point we're just happy with the way things are rolling and happy with how Eickhoff's progressing and happy that are guys are coming together at the big-league level right now." Mark Leiter Jr. (flexor strain) will pitch Tuesday in a rehab assignment with high-A Clearwater. … Adam Morgan "feels better" a day after being placed on the disabled list with a lower-back strain, Kapler said. … J.P. Crawford (pronator flexor strain) hit off a tee Tuesday. …Victor Arano (shoulder strain) is "really close," Kapler said.